London’s popular night time street food market is back, and as this gluttonous writer will tell you, it’s better than ever. 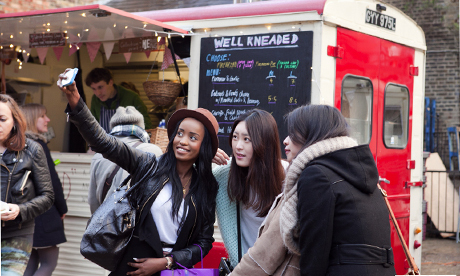 London’s finest street food vendors will set up shop every Friday evening (from 5pm until midnight) until the end of June at the Merchant Yard on Kingsland Road. Street Feast’s roster of traders changes each week, but a few big names on the London street food scene make repeat appearances. ‘The Ribman’ has been a regular so far, serving his tasty slow-cooked ribs with homemade sauces until they sell out (which is fast!). Fans of ‘Yum Bun’ will be happy to see the hand-made steamed buns available and The Bowler’ bowls up to serve great British meatballs on select nights. But it’s not just the mouth-watering food that’s the big draw here. The traders themselves are passionate, enthusiastic and chatty which, compared to the sometimes overly stuffy and polite London restaurant scene, comes as a welcome change. It’s also about soaking up the atmosphere. There are a few tables and chairs strewn about, but you’ll be lucky to grab one. Instead, wander around sipping a local craft beer and indulge your senses. Besides, as soon as you sit down and finish your meal, you’ll want to get back up to try something else. Top tip – go with friends and share a few different tastes. If service and covered seating is more to your liking then consider booking the Stripped Back menu from young chef Ben Spalding, where four courses and an alcoholic beverage in a heated area are priced at a reasonable £27.50. The sticky toffee pudding was so delicious that when my dining companion accidentally dropped a piece onto the dirty and dusty street floor he quickly invoked the “ten second rule!” before popping it back into his mouth. Disgusting maybe, but until you’ve tried some of the goods from the Sweet Tooth Factory, you shouldn’t judge. This home for ‘London’s nomadic street food circus’ is not to be missed this summer. However, be sure to turn up early as queues tend to start from 7pm. However, with a drink in hand, the queue is well worth the wait.